Another one-of-a-kind animated short film to watch. Alike is an animated short film from Spain directed by Daniel Martínez Lara & Rafa Cano Méndez. The short is about a father trying to teach his son how to live a unique life, only to realize how much society drains our creativity and originality. This reminds me a bit of Disney's short film Inner Workings, which played before Moana last year. What I love about this short film is the simplicity of it - there's no dialogue, it's all about these two characters, but it has so much to say, and it's easy to pick up on all of that. Most importantly, this reminds us that we should listen to our hearts. Thanks to Vice's Creators for the tip on this short. Original description from Vimeo: "In a busy life, Copi is a father who tries to teach the right way to his son, Paste. But… what is the correct path?" 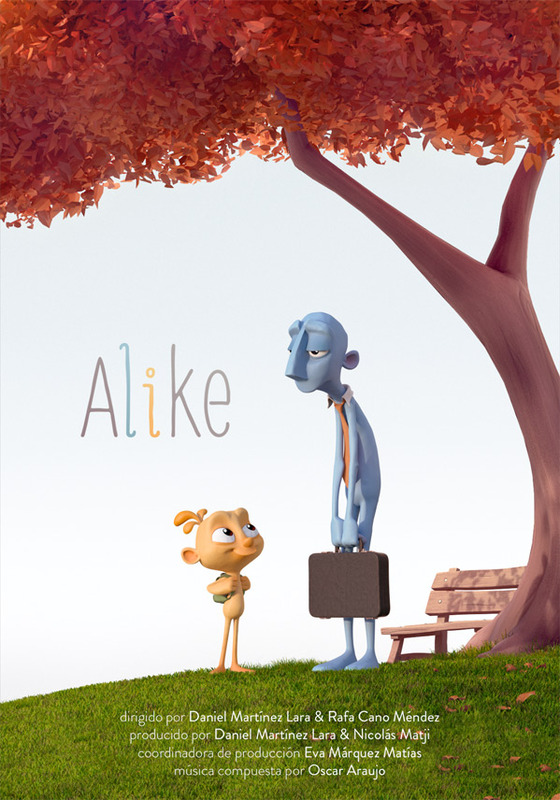 Alike is an animated short film made in Spain directed by Daniel Martínez Lara & Rafa Cano Méndez. Featuring music by Oscar Araujo, and sound by Aleix Vila. The film originally debuted at Mundos Digitales in 2015, and has since picked up 69 awards at festivals all over the world. For more info, visit the film's official website. You can learn more about the making of Alike here. To see more shorts, click here. What did you think of this?